Rason” or “Rassam” is a spicy soup that originates from South of India. Served as an accompaniment dish or as a starter soup. 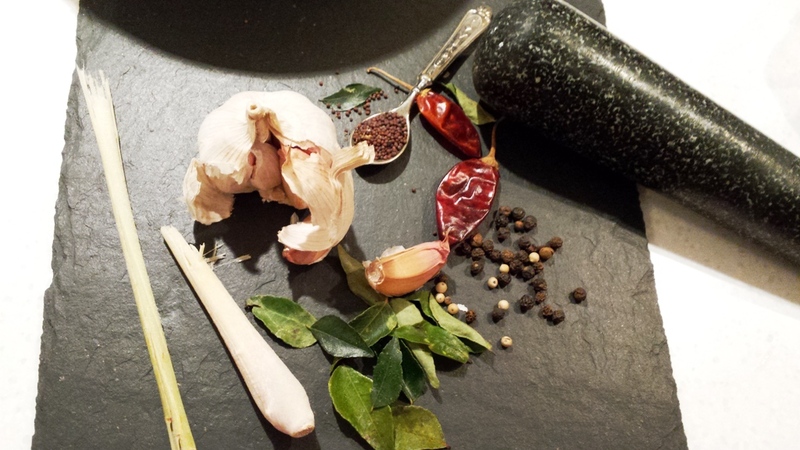 Made with an array of spices, fresh herbs this soup is full of flavour. 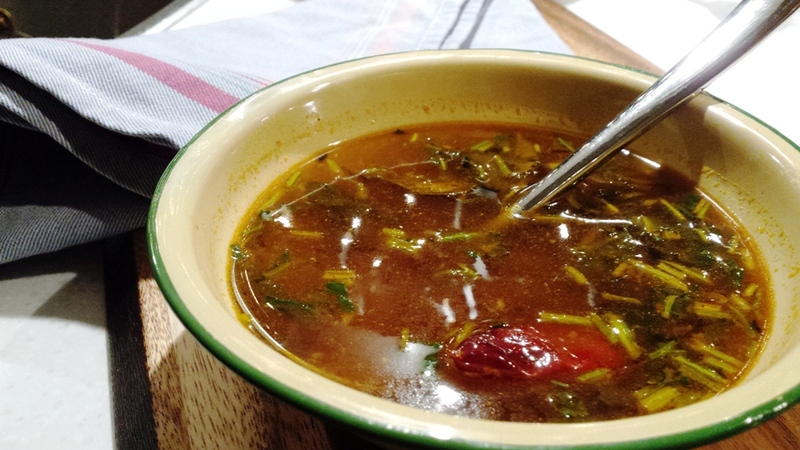 With all the different spices in this dish, full of antioxidants, it is a perfect meal as a bug killer and many people crave for such soups when they have a cold. It is quite soothing especially when one has a nasty bug and loses the sense of taste, “rason” is the god sent kind of soup. This is certainly a warming dish perfect for the winter season. The best way to drink this soup is from a silver glass or Dabara glass (which we call “Gillas” in Mauritius). A common thing we see on dining table at wedding and religious gatherings. My excuse to do the Rassam this week was to treat a poorly husband who had a nasty cold so this spicy soup had to be on the menu, just what the doctor (the wife) ordered. Like a good “desi” wife I am feeling sorry for my husband who has been sick for the last few days, he is coughing, sniffling – and feeling sorry for himself. I could not think of a better dish to bust up these nasty bugs. Bugs buster here we come with a big bowl of “Rason”!!! 1 – 2 Tbs tamarind paste. Wash and boil the dhal in a pressure cooker until soft and almost creamy and set aside. Drain the dhal and keep the liquid stock separate. To make the spice paste, put the chopped the tomatoes, whole peppers, ginger and garlic, mustard in a food blender and blitz to a paste. Using a rolling pin or mortar bash the coriander stalk and the lemon glass stalk, this will help release the flavours. Heat the oil; fry the onion, curry leaves, chopped onions for a minute. Add the turmeric powder, asafetida, followed by the spice mixture paste, cook on low heat. Add the cooked dhal, tamarind paste, whole dried chilli, coriander stalks, lemon grass (if using) and cook until all the spices have incorporated well. Season with salt. Add the dhal stock to spices and leave to simmer for 4-5 minutes. Now add more water to make up to the required amount of soup you want to make (approximately 500 mls), stir well, taste for seasoning and adjust as required. Reduce heat add more water if required and leave to simmer for another 30 minutes. To serve sprinkle with chopped coriander leaves and serve hot. 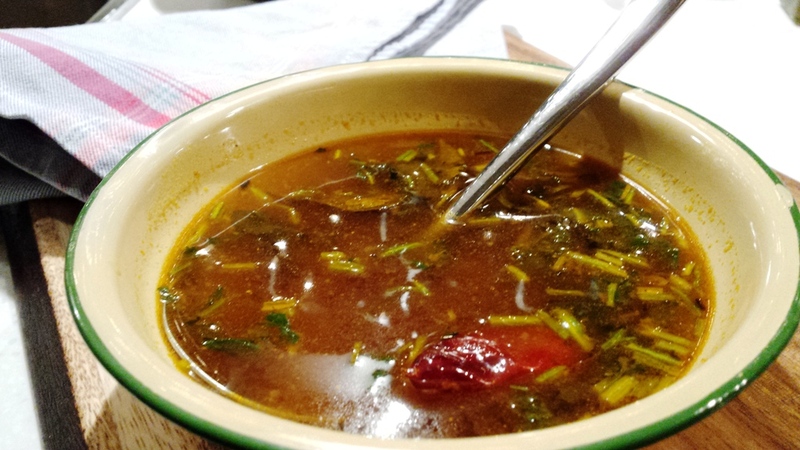 Brinda’s Note: Can be served as an accompaniment dish or served as a soup.